When you look at an Ordinance Survey map of the Outer Hebrides you will see they is as much fresh water as they is solid land. They are criss-crossed by a network of lochs and rivers. This area, renowned as one of Europe's last wildernesses, is protected as a Ramsar wetland site of international importance, as well as including many SSSI's (Sites of Special Scientific Interest). 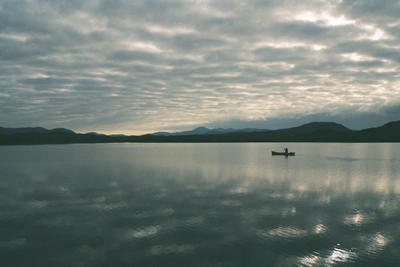 Whilst very magical, traveling in this area by foot is difficult and tiring and involves long detours or wet bog-slogs. However, open canoes are the perfect form of transport. 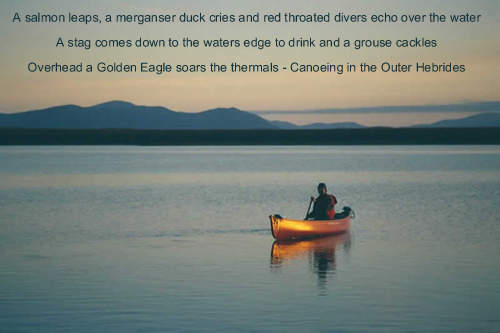 Nearly silent, canoeists glide across the water, approaching birds and animals unseen and unheard. Combining open-canoeing with hill-walking, bird-watching or fishing is a perfect day out. Take a tent and spend a weekend, a week,or even longer. There are hundreds of lochs and rivers to explore.